A holiday in Tunisia promises exotic markets, sandy beaches, hot summer sunshine and architectural wonders, proving popular with couples. With its long, sandy coastline backed by the Sahara Desert, Tunisia is a haven for sun worshippers. Holidays in Tunisia combine golden beaches with golf courses, luxury hotels and indulgent spas, providing everything that's needed for a relaxing getaway. In the capital Tunis and the city of Carthage, you'll find all the ruins, mosques and markets you'd expect from a trip to North Africa. For rural charm, head inland to villages like Sid Bou Said, perched high on a hill over the Bay of Tunis. Yasmine Hammamet’s dreamy beach, marina and shopping promenade were literally made for tourists, while Sousse offers a more authentic Tunisian experience. Old Hammamet has a 12th century medina, while stylish Port el Kantoui has a smart harbour. Away from the mainland, the tranquil island of Djerba is a perfect spot to totally unwind. 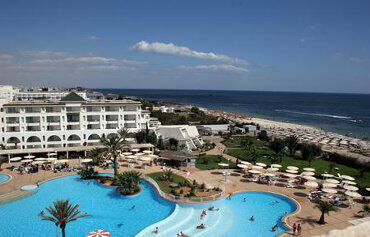 Beaches, luxury, culture and relaxation - why not indulge yourself and enjoy a holiday in Tunisia this year. Everything at the 5 star El Mouradi Palm Marina in Port el Kantaoui is geared towards winding down. 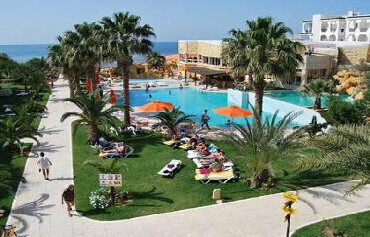 Firstly, the hotel is set in lush gardens which lead down to a swathe of golden sands. 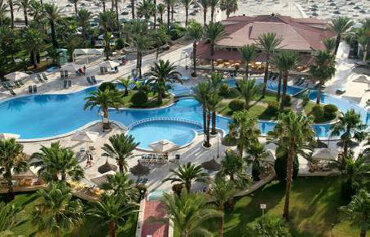 Secondly, it boasts a host of luxury facilities and activities for all ages. 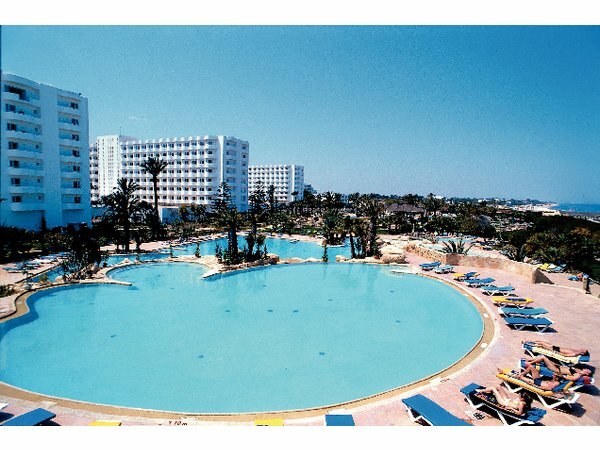 With a swathe of sandy beach as its main neighbour and set amongst stunning tropical gardens, the Iberostar Diar El Andalous has bagged itself the perfect spot in Port el Kantaoui. Arabian style architecture greets you when you check in to the Skanes Serail Hotel in Tunisia. This 4 star property boasts a prime beachside location and a plethora of onsite facilities to suit all tastes. Set on a stunning private beach in Hammamet, Le Paradis Palace Hotel takes some beating when it comes to fun filled holidays in Tunisia. This 4 star hotel is made up of bungalows and traditional hotel rooms, scattered in landscaped gardens. 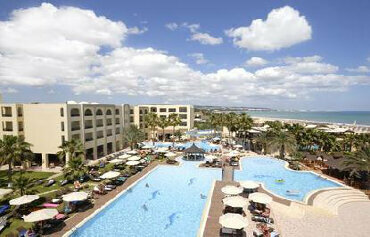 The all inclusive Hotel Riviera is in a great spot close to the beach and Port el Kantaoui resort centre. This 3 star Moorish style hotel has been built with family holidays in mind and offers a plethora of facilities for all ages. Waterslides, watersports and activities galore are just some of the attractions that await at Hotel Sahara Beach in Skanes. 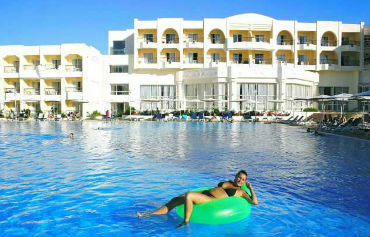 There is plenty to write home about on a stay at the Riad Palms Resort & Spa in Sousse. This 4 star all inclusive hotel is set in lush gardens and enjoys a beachfront setting and a plethora of facilities for all ages. There is plenty to write home about on a stay at the 4 star Golden Beach Hotel in Skanes. 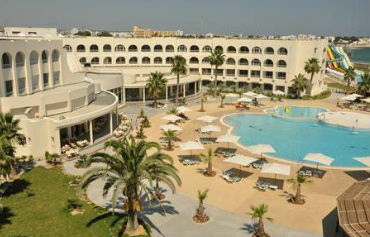 As its name suggests, this 4 star hotel sits on the beach and boasts abundant onsite facilities for all the family. 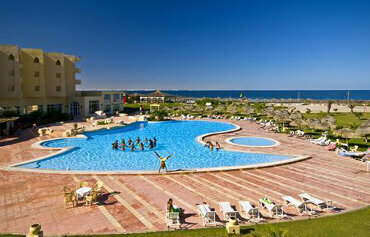 Reminiscent of an Arabian castle, the Iberostar Solaria boasts an enviable position by the beach in Hammamet. 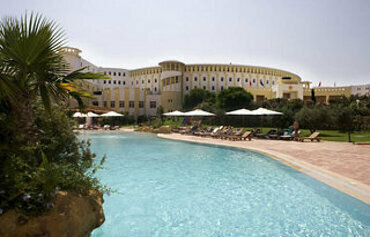 This 5 star all inclusive hotel has a relaxing vibe for adults and plenty to keep the children entertained too. If you want to hit the pause button on your next holiday to Tunisia, El Mouradi Gammarth will tick all the boxes on your wishlist. This luxury Tunisia hotel sits alongside the beach in Gammarth and boasts a plenitude of onsite facilities and tasty dining options. Sitting alongside a sandy stretch of beach, this all inclusive resort offers a wealth of onsite facilities and amenities. The pool scene is the star of the show. The weather in Tunisia is one of its main attractions, with summers hot and dry. And whilst the winters are by no means scorching, it's a great place to head to escape chilly Britain in the colder months. The northern area of Tunisia has a Mediterranean climate, hot dry summers and cool rainy winters. Average temperatures from May to October are 19°C to 26°C. August is the hottest month. In the winter, rain is frequent, temperatures averaging 10°C to 13°C. 600 miles of sandy coastline mean that holidays in Tunisia tend to be very much beach based. Aside from snorkelling, sunbathing and boat trips, there's a whole lot more to be discovered in this fascinating country. A choice of top class courses make Tunisia a great value golfing destination and you'll find history and heritage galore in Tunis. Don't miss a camel ride in the Sahara, or haggle for colourful gifts on a shopping trip to an ancient medinas at Sousse and Monastir. Port El Kantaoui and Yasmine Hammamets nightlife is often hotelbased. Head to the resorts' marinas for stylish bars and a few dance spots. Sousse and Monastir have plenty of waterfront bars and cafes. For livelier nightlife, head to Hammamet, where Moncef Bay strip is lined with softly lit bars, pubstyle hangouts and clubs playing everything from house to salsa. Most hotels serve up international dishes in buffet style. Tunisian food combines Arabic, Mediterranean, Middle Eastern and French influences. Traditional Tunisian specialities include the national dish of Couscous served with vegetables, lamb, poultry or fish, Agneau la gargoulette is a lamb stew which is cooked over charcoal fire in an earthenware dish and Tagines which have everything from chicken to beans, beefs, onions, tomato sauce, spinach, egg, prunes and honey. Harissa paste adds the spicy flavour to most dishes. Baklava is one of the popular pastries in Tunisia and typical desserts include fresh fruit, sweet pastries and custards. Tea served with mint leaves is a popular drink. For value for money, book an all inclusive hotel, where snacks, meals and selectd drinks are included in the cost of your holiday.